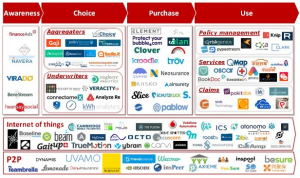 It is not a secret that I’m an insurtech enthusiastic: I have shared my view about the need for any insurance player (insurer, reinsurer, distributors, etc.) to become an insurtech-player during the next several years. This will mean: organizations where technology will prevail as the key enabler for the achievement of the strategic goals. 4. Persistence: Increasing the renewal rate, and, thus, stabilizing the insurance portfolio. 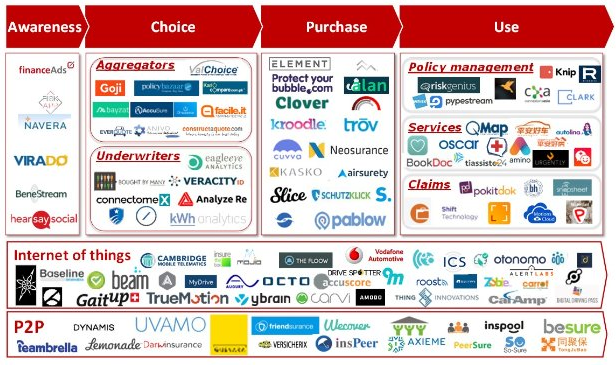 The insurtech ecosystem has shown terrific growth in the last 20 months, after many VCs complained about the absence of insurtech startups. The updated Venture Scanner’s map shows more than 1,000 initiatives, with more than $17.5 billion invested. The needs for a pragmatic approach, the ability to prioritize the initiatives and a stronger focus on innovation have become more and more relevant. I strongly believe in the effectiveness of the aforementioned four axes to evaluate a business. In the last few months, I followed this view to make investment and career choices. 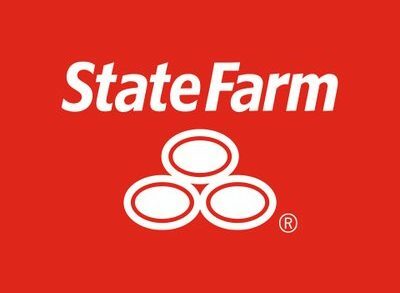 At the beginning of the year, I invested in Neosurance, an insurtech startup currently accelerated by Plug & Play in Silicon Valley, and I’m supporting the company as a strategic adviser. This company developed a platform to enable incumbents to sell the right product with the right message at the right time to the right person. By using artificial intelligence, Neosurance aims to become a virtual insurance agent with the ability to learn and improve how it sells. I fell in love with its model because of its productivity angle, the first of the four Ps. Let’s consider all the non-compulsory insurance coverages. The large part of the purchases have been — and still are — centered on a salesman’s ability to stimulate awareness and to show a solution. In a world that is getting increasingly more digital and is becoming less about human interaction, I’m skeptical about the ability to cover the people’s risks with the current approaches of online distribution, comparison websites and on-demand apps. All three of these approaches require a rational act and a lot of attention. But many customers look like more to Homer Simpson than to Mr. Spock. Those are the reasons I’m optimistic about Neosurance’s business model. On one hand, its B2B2C model aims to be present where and when it matters most for the customer. And, its “push” approach is able to preserve underwriting discipline, which is the only way to continue in the middle term and distribute a product that keeps a promise to the customers. My investment choice was based on the business model evaluation, the company’s pipeline and the quality of its team. I hope to be able to make more investments. I also decided it was time for a job change at the end of 2016. After 11 years, I left my career with Bain & Company, where I advised the main insurers and reinsurers on the European market. I had focused my activity on the single insurtech trend I’m passionate about: connected insurance. In the last several years, I have advised more than 50 players on this topic — from insurers to reinsurers and from service providers to investors. I consider the use of sensors for collecting data on the state of an insurable risk and the use of telematics for remote management of the data collected to be a new insurance paradigm. For years, many of the use cases we have seen globally have only somewhat used the potential of this technology to support an insurer and achieve his or her strategic goals. Let’s start with the proximity angle. Insurers have provided telematics-based services that have reinvented a driver’s journey. More and more players are focusing on this opportunity to create an ecosystem of partners to deliver their suite of services. Discovery Insure is one of the best at doing this because it is able to reward clients with a free coffee or smoothie for each 100 kilometers they drive without speeding or braking hard. Is there a way for you to be closer to your client? The Italian market shows the potential benefits in terms of persistency. There are more than 6.5 million cars with a device connected to an insurance provider in Italy, and the telematics penetration reached 19% in the last three months of 2016. On average, the churn rate on the insurance telematics portfolio is just 11%, which is lower than the 14% churn rate on the non-telematics portfolio. Last — but definitely not least — is the profitability side. The Italian telematics portfolio shows a claims frequency that, risk-adjusted, was 20% lower in comparison with the non-telematics portfolio, as I mentioned in a paper last year. The best practices were able to achieve an additional 7% average claims cost reduction by acting as soon as a claim happened and by reconstructing the claims dynamic. 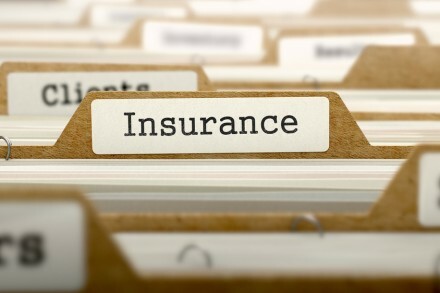 These savings let insurers provide an up-front discount to the clients. This makes the product attractive and achieves higher profitability. My day job is now to run an international think tank focused on connected insurance. More than 25 companies have joined the European chapter since the beginning of the year, and eight players have joined the North American chapter since March. 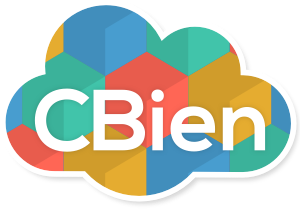 This initiative is developing the most specialized knowledge on insurance IoT, which is based on a multi-client research. I personally deliver the contents through one-to-one workshops dedicated to each member. Throughout the rest of the year, I will host plenary meetings with all the players to discuss this innovation opportunity. I felt honored and privileged last spring when former Iowa insurance commissioner Nick Gerhart invited me to present my 4 Ps at the Global Insurance Symposium 2017 in Des Moines, but I did not realize how this framework would so deeply influence my life decisions.